Though Apple Watch battery lasts a reasonably long amount of time, having a powered off or dead battery Apple Watch on the wrist is not particularly useful. One helpful tip when you approach the lower bounds of battery remaining is to switch into Power Reserve Mode on Apple Watch. Power Reserve Mode turns the Apple Watch screen into just a watch, allowing you to at least tell the time when the battery gets quite low. 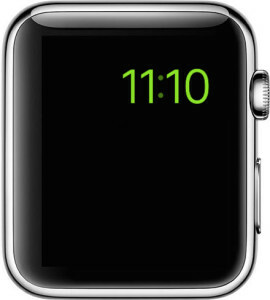 With Power Reserve Mode enabled, Apple Watch will cease all functions except a limited onscreen clock display. 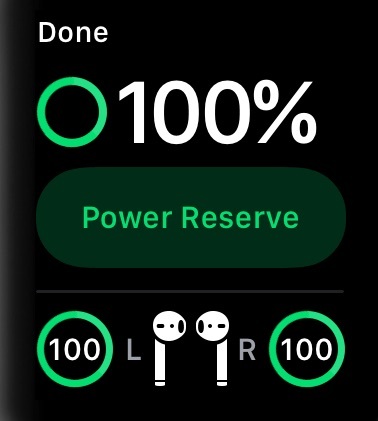 While you can enter Power Reserve at any time, this is not something you’d probably use for fun since it disables basically all features of Apple Watch like fitness tracking and heart rate monitoring, messaging, notifications, etc. With that said, it’s an incredibly effective way to continue to use the Apple Watch as a time-telling device in situations when it would otherwise run out of battery. As you can see, with Power Reserve you just get a simple clock, that’s it. All other features on the Apple Watch are disabled. 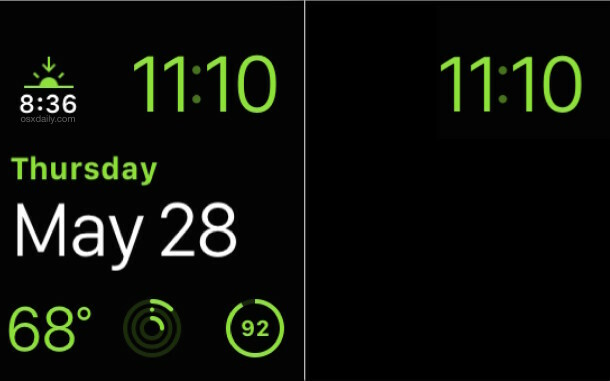 The Watch in this power saving mode can last a very long time however, and I’ve managed to squeeze many hours out of it after the regular Watch functions have drained battery down into the single digits. This basically reboots the Apple Watch. 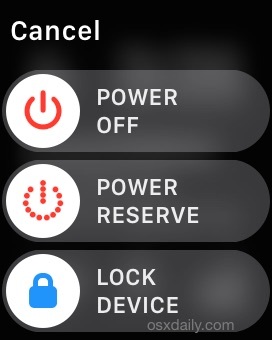 While you can exit out of Power Reserve mode at nearly any time (unless battery is critically low), you’ll immediately start draining battery again, so if you’re lingering at 1% or 2%, you’ll probably want to stay in Power Reserve until you can access the Apple Watch charger. So, to reiterate, Power Reserve Mode enables a simple clock on Apple Watch screen, and that simple clock is all you get. That may seem limited and frustrating, but consider it’s use case and you’ll understand why this feature is actually really great. 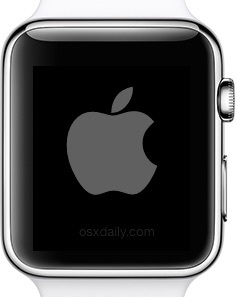 Besides, having a clock on your wrist is certainly better than having a dead black screen on your wrist, right? 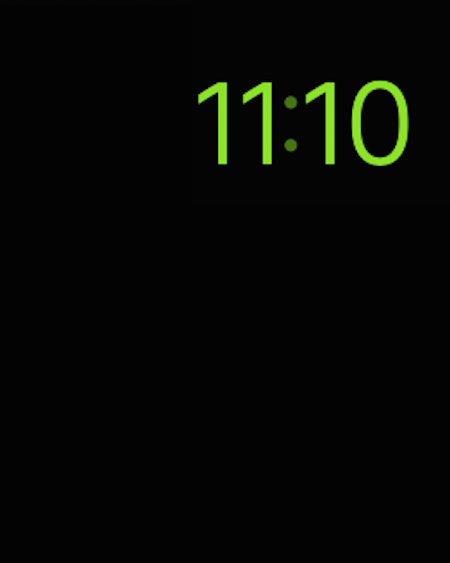 Super helpful feature, I just wish they would have left a tiny date indicator on the face in addition to the time. This tip might seriously help the 3 watch owners out there! Question! Apple Nike watch accuracy, I just ran 30k 01/21/2017 my watch said I ran 23.69mi the course was 18.6mi. Should it be that much differents? My Series 2 Watch tends to end up with ~70% remaining battery at the end of a day. Rather than throwing it on the charger, I put it into Power Reserve overnight. In the morning, I bring it out of Power Reserve, get a full second day of use. At the end of that day, I typically have 25-35% remaining. At that point, I usually place it on the charger, though I probably could get away with a second night of Power Reserve. In fact, I probably need to remember to let it drain all the way once (or more) a month.